The Sandinistas developed out of the student radical circles in Nicaragua in the late 1950s and early 1960s. They were influenced by the nationalist example of the FLN in Algeria and later by the Cuban revolution. They engaged in a guerrilla war with the corrupt and murderous dictatorship of Anastasio Somoza, and eventually following a general strike and urban insurrection, overthrew the reptilian Somoza in 1979. The Sandinistas inherited a country stripped of its financial resources by the fleeing Somoza, 30-50,000 dead from the protracted guerrilla war, 600,000 made homeless and a smashed economic infrastructure. In addition, Somoza had deliberately not introduced any literacy programs, as he wanted only “oxen” in his own words. The Sandinistas instituted a sweeping packet or reforms, including a massive literacy programme. Property held by Somoza and his supporters was nationalised. Soon the Sandinistas fell out with other Nicaraguan political parties, and Daniel Ortega, head of one of the three main factions in the Sandinistas, was accused of developing a Cuban-style system in Nicaragua. 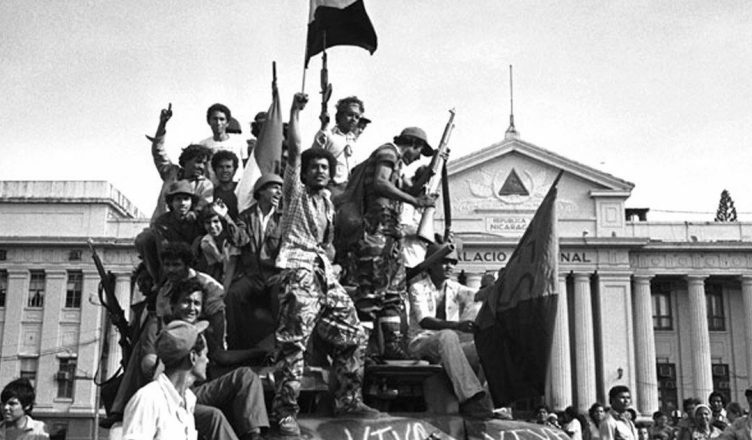 Armed groups from different factions, and collectively known as the Contras then began a war against the Sandinista government, and were heavily backed by the US. Ortega was elected President in 1984. A year later the US under Reagan instituted a total embargo on Nicaragua and the Contra war dragged on until 1989, claiming many lives. In 1990 the Sandinistas ceded power to Violeta Chamorro at the head of an anti-Sandinista coalition that ranged from conservatives through liberals to Communists. In a deal to buy off the Sandinistas, the land and property that had been nationalised was handed over to the Sandinista leaders, and this involved millions and probably billions of dollars. Ortega’s tendency within the Sandinistas, the terceristas, had always favoured an approach that married armed insurrection to cross-class alliances with business owners, the churches, professionals on one hand and shanty-town dwellers and the unemployed on the other. This strategy is echoed in other Latin American left nationalist movements. In 2006 Ortega won the presidential elections, with a former Contra leader as his running mate. He firmed up his alliance with the Catholic Church and as a part of this deal introduced strict legislation against abortion where before in the 1980s he had supported abortion rights. He also formed an alliance with the Constitutional Liberal Party. He began to build alliances with Iran, Cuba and then Venezuela. Recently he has increased his ties with China and Russia. He was again re-elected in 2011 and in 2016. He increased his support of business in this period. Using the assets from the confiscated land and property, Ortega and his wife Vice-President Rosario Murillo, together with other Sandinistas formed an alliance with big businessmen to build up a considerable business conglomerate, which includes control of various media outlets. Meanwhile Nicaragua’s social spending per head is one of the lowest in the region. 62% of the population live in dire poverty, whilst there are around 250 multimillionaires who have prospered under Ortega. This April 18th Ortega announced cuts in pensions and increases in social security contributions as dictated by the International Monetary Fund. This was a bridge too far for many. Barricades were erected in towns south of the capital Managua, and heavy fighting with police and army has resulted in many deaths. The unrest has continued now for three months and shows no signs of abating. The movement has increasingly called for the removal of Ortega and Murillo. The USA for its part, whilst looking favourably on Ortega’s pro-business positions, is disturbed by the Nicaragua-Venezuela-Cuba axis, and the links with Russia, China and Iran. The revolt in Nicaragua must not be allowed to be hi-jacked by the US, who would install another reactionary regime more compliant with their policies. The whole sorry scenario in Nicaragua, and indeed in Mexico and Venezuela, reveals the bankruptcy of leftist politics in Latin America. It is even more imperative that a pan-American revolutionary anarchist movement is developed, a movement based on the working class, peasantry and indigenous peoples, not tied to any of the power blocs, and that the road to social revolution is opened.